Forces of nature have a way of making things right. A week before Compostela Valley, near Davao City in Mindanao, opened this year’s Beachfest bearing a marine environment theme, 21 Hawksbill turtle hatchlings were rescued from sea predators off Kopiat Island. This incident has encouraged Compostela Valley Tourism Officer Christine Dompor to strongly push for the declaration of Kopiat Island as a turtle sanctuary, and make it a parallel project of the Beachfest which is held annually to entice visitors to enjoy Compostela Valley’s beach resorts. Kopiat Island, off the coast of Pindasan, dots the Mabini Protected Landscape and Seascape of Davao gulf. 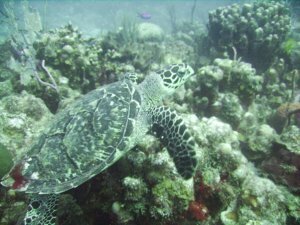 It is a known breeding ground of the hawksbill and leatherback turtles. Sea travel around Kopiat Island takes about 20 minutes by motorized boat, while in-land tour on the 87-hectare island takes about 45 minutes. A portion of the island encircles a seven-hectare lagoon. Unknown to many, the island hosts unspoiled reef areas with rare coral beds that house exotic marine life. 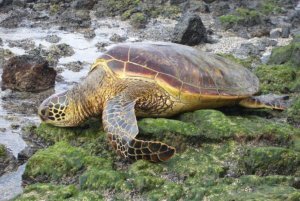 All of the five marine sea turtle species in the Philippines are found in Davao Gulf, which are the Hawksbill, Oliver Ridley, Green Sea, Loggerhead, and the Leatherback turtles. Two – the hawksbill and the leatherback turtles – lay their eggs on the coasts of Kopiat island. “Whatever initiative that the local government may have in the area especially in protecting wildlife, we are supporting their effort,” he said in a separate interview. The island is the staging point of the Compostela Valley Beachfest’s 800-metre Kopiat Swim Challenge. The provincial sports event has been organized to raise awareness in protecting and conserving the rich biodiversity of the Mabini Protected Landscape and Seascape in Davao gulf. The Provincial Tourism Office of Compostela Valley is placing a lot of importance on Kopiat Island as a tourism come-on lying along the Davao Gulf located in southeastern Mindanao in the Philippines. Davao Gulf has an area of 308,000 hectares and cuts into the island of Mindanao from the Celebes Sea. It is surrounded by all four provinces in the Davao Region. The largest island in the gulf is Samal Island. Davao City, on the gulf's west coast, has the largest and busiest port on the gulf. Three million people in four cities of Davao, Island Garden City of Samal, Panabo and Tagum, and in 18 municipalities are living around the gulf with thousands relying on it for food and livelihood. North of the gulf lies the coastal municipalities of Maco, Mabini, and Pantukan of the province of Compostela Valley as well as the coastal towns of Davao del Norte and Davao Oriental. Mabini, approximately 70 kilometers away from Davao City, is located in the southeastern section of the province of Compostela Valley. It is bounded on the north by Maco, on the south by Pantukan and on the west by Davao Gulf. It is part of the Mabini Protected Landscape and Seascape. The said protected seascape and landscape covers a coastal area of approximately 3,433 hectares more or less, inclusive of the mangrove wilderness area of Pindasan Island. Kopiat island and Lunod island are found off the coast of Mabini. The Philippine Environmental Governance Project 2 (EcoGov), a technical assistance project in the Philippines funded by the United States Agency for International Development (USAID), has identified Davao Gulf as a feeding ground for 11 species of cetaceans including sperm whales, killer whales, and bottle-nose dolphins. A number of these species regularly swim the channels between the islands and mainland Mabini to feed on the seascape’s sea-grasses, rich with plankton and krill. But sightings of these endangered marine mammals have become rare in the past few years.